The Baynhams: Gland Slam Glory! I just love this story! It is about baby Fionn. He is my friend Fiona's little boy who has been in the right place at the right time a couple of times in his young little life! Baby Fionn Shorthall might only be nine months old but he's the envy of rugby fans the length and breadth of the country. 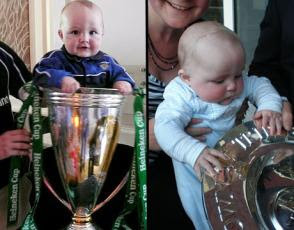 The baby boy from Killiney in Dublin has met both the Irish and Leinster teams and has been pictured beside the European Cup and the Grand Slam trophy. Fionn's mum Fiona says her son was born lucky and reckons he has brought unfounded luck to Irish rugby this year. "Fionn's birthday is 28/08/08, and apparently everyone says that three eights in a birthday is lucky, or so the Chinese say, and certainly we've been lucky with him so far. "My husband Martin is a huge Leinster fan, he's an absolute fanatic." The entire Shorthall family, including Fionn's sisters Anna (4) and Eimear (7), met the Leinster team on Sunday when by chance they decided to call into the Four Season's Hotel, where the rugby heroes were staying. "We were passing the Four Seasons and I wondered if the team were staying in there so we said we'd go in and see. "Then the cup was behind the bar, and we put the baby up beside the cup to show how small he is. "Fionn just loved it and I was so chuffed first of all to get the cup and then to get him into it was just fantastic." The rugby-mad family also got to meet the winning team after Ireland's Grand Slam victory. "When Ireland won the Grand Slam we were on the road near Killiney Castle and we saw the team bus going in so we followed it and we have a picture of him beside the trophy. "My nephew turned to his Mum during the Leinster game and said "I think Fionn is the lucky rugby mascot'." Meanwhile, Fiona doesn't know if there's any hope of Fionn getting to see the Lions Trophy this summer. "We've no tickets for South Africa so unless they can bring it home here then he probably won't get to hold it. "And whether he'll get to the world cup in New Zea-land in 2011, who knows?"